On the surface, nothing has changed. Black Friday always was, and still is, the biggest shopping event for retailers across the US, and across the Western European countries. The ecommerce business is no different! As the holidays approach, both traditional retailers and digital entrepreneurs are rushing to get their share of the market. For instance, four years ago, Macy’s opened its doors at midnight on Black Friday; the next year, stores opened at 08:00 PM on Thanksgiving, and for the last two years, the opening time moved to 06:00 PM. Finally, as CNN Money reports, this year Macy’s is kicking off its sales at 05:00 PM – an hour earlier than the prior two years. But that’s nothing compared to a certain eCommerce giant. As you may recall, last year Amazon decided to launch their Black Friday Deals store on 11.02. – over three weeks before the actual event. And while brick and mortar sales went down for over a billion, online sales jumped 14% from 2014, bringing in more than $2.7 billion, according to the retail research firm, ShopperTrak. Now, while the magnitude of opportunity presented by the holiday is obviously a serious matter, many retailers fail to adequately prepare their websites for this annual occurrence. We’re not just talking about smaller companies. In 2014, after a record-breaking spike in traffic, Best Buy’s official website famously suffered a Black Friday outage, which lead to thousands of complaints from unsatisfied customers from all across the United States. 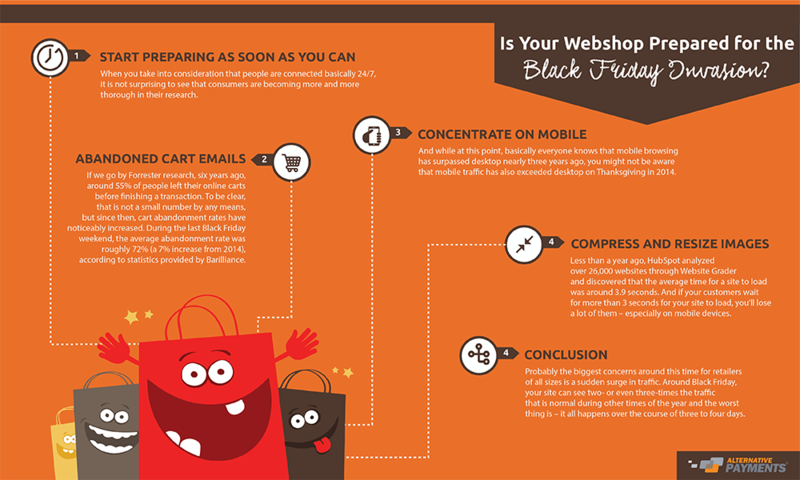 So, does your site have what it takes to survive this Black Friday? With last year’s record-breaking sales, and more than 120 million people that plan to shop online on Cyber Monday, it would be foolish to miss out on such an opportunity and fail to earn some of that post-Thanksgiving money. When you take into consideration that people are connected basically 24/7, it is not surprising to see that consumers are becoming more and more thorough in their research. According to a NFR study, 40% of consumers are planning their Christmas shopping in October. Ideally, you want to prepare your sale a few months in advance, and start letting your visitors know about it as soon as you can. What’s more, you should also ensure that consumers looking for discounts and information on particular products find your online store as well. If we go by Forrester research, six years ago, around 55% of people left their online carts before finishing a transaction. To be clear, that is not a small number by any means, but since then, cart abandonment rates have noticeably increased. During the last Black Friday weekend, the average abandonment rate was roughly 72% (a 7% increase from 2014), according to statistics provided by Barilliance. Naturally, you should try to keep the number as low as possible, and one of the most effective ways of preventing cart abandonment is by setting cart recovery emails. This way, when a visitor adds a couple of products to their cart and leaves your store, you can use a compelling email and try to bring them back to complete the transaction. And while at this point, basically everyone knows that mobile browsing has surpassed desktop nearly three years ago, you might not be aware that mobile traffic has also exceeded desktop on Thanksgiving in 2014. If that’s not enough for you, you should also be aware that the same Black Friday weekend saw over 25% of customer orders come through a smartphone or a tablet (you can read Custora’s full report on their official website). And while we don’t have an up-to-date research on this matter, we should expect this trend to continue in the next few years, and even increase. Therefore, you should ask yourself what’s your mobile store’s experience like on a smartphone? In order to make sure that the navigation is intuitive and the interface responsive, you should do a couple of tests and see for yourself what your store looks like on mobile. Less than a year ago, HubSpot analyzed over 26,000 websites through Website Grader and discovered that the average time for a site to load was around 3.9 seconds. And if your customers wait for more than 3 seconds for your site to load, you’ll lose a lot of them – especially on mobile devices. You might be asking yourself – how can you ensure that your site loads as quickly as possible? Well, there are a few things you can do. For starters, you should minimize third-party snippets that slow down loading time by displaying content from another service. And more importantly, you should make sure that all of your images – especially those on your home page and of your top products – are properly optimized. As we mentioned before, probably the biggest concerns around this time for retailers of all sizes is a sudden surge in traffic. Around Black Friday, your site can see two- or even three-times the traffic that is normal during other times of the year and the worst thing is – it all happens over the course of three to four days. So, what can you do to prepare your site for all of those visitors? If you utilize a CDN (Content Delivery Network), make sure that your IT team reaches out to your provider and makes plans for the increased traffic. If not, have a few words with your web hosting provider and ask about the traffic limitations and if needed, costs of an upgraded server. As all of those numbers have shown, more and more shoppers are choosing to forgo long lines, crowded stores and stampeding mobs of shoppers to shop online from the comfort of their own homes. And finally, we are steadily approaching a tipping point where online transactions will no longer be an alternative for enthusiastic shoppers, but the norm. There are 0 comment. 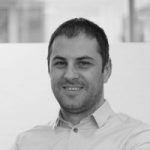 on "Is Your Web Shop Prepared for the Black Friday Invasion?"